'why to buy’ sales concept. 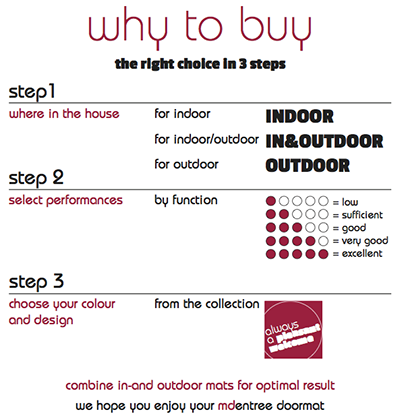 Market research has shown that it is difficult for the customer to make the right choice within the doormats range. Nowadays the choice is often based on price rather than on function; while this is the most essential part next to colour and design. MDentree has developed and registered in collaboration with a renowned marketing agency a unique system in order to serve the consumer in its best way. In addition, the effective mdentree performance points system. At a glance the different features are easy to read and can simply be compared with each other. Multiple coloured balls means better performance for the specific component. This is also the right tool to explain and justify the price differences. It simplifies the decision where after a deliberate choice can be made. Upselling is made possible and push sales evidently. The 'why to buy' banner must be showed clearly visible at each presentation and is a good guide for both the end consumer and your sales team. Finally the care of the mat is important. This is indicated by various symbols on the product packaging. Are you interested in 'why to buy' in your sales area? For more information please fill in your data, we will contact you as soon as possible.